You have a wide array of tools in your marketing toolkit, but many marketers gloss over an immense lead resource: their website. What if you could be handed a record of your website’s visitors? Not just the ones who converted, but many of the ones that didn’t. Your website is a wellspring of leads waiting to be tapped. The amount of leads who convert on a form amounts to around 2% of your total visitors. Think about that: 98% of your website’s visitors click away without converting. They’re interested enough in your products or services to visit your site. They might have made it as far as your contact or pricing page – they might have been on the cusp of converting – before clicking away. And then they’re gone. Just another number in your website traffic report. That’s a hefty volume of traffic to be slipping through your fingers. Especially when buyers are 60% through their decision-making process before they ever contact a vendor. There are numerous solutions out there for optimizing conversion rate on your website. These tools assist in analyzing customer behavior with webpage heatmaps and visitor session playback. But to truly unlock the lead generation potential of your website, you need to do something about all the ones that don’t convert, even after you’ve optimized your site for conversion. Record visitors to your website. Identify visitors in the 98% that aren’t converting. Highlight the most promising potential leads. Top up your marketing funnel with B2B leads. This is where Clickback WEB comes in. It allows you to record each website visitor individually. This can generate a huge volume of potential leads as you suddenly have insight into all the visits that were previously hidden. You’ll see which companies have visited your site as well as insightful information about those companies like industry and number of employees. A tidal wave of new potential leads is fantastic, but quality is important too. Once you’ve tapped into the additional 98% of your website traffic, you need to drill down and ensure you target the highest-quality leads. Clickback WEB gives you the tools to do that by creating a record of each visitor’s events, actions and behavior. Not all website visitors are created equal. A prospect that visited and read through your product page and pricing page is more interesting than one that took a glance at your home page and clicked away. Clickback WEB enables you to give each page on your website a point value, letting you indicate which ones are more important. You can also assign scores to many different events, actions and behaviors. Each visitor to your website’s interactions – which pages they visited, how long they spent there, which industry they work in, and more – are recorded, giving them a total score. This score gives you a valuable, customizable insight into which visitors are the most valuable. Of course, not all visitors are prospects you wish to market to. There’s no sense expending marketing overhead on competitors, for example, nor sending top-of-the-funnel content to existing customers. Conversely, identifying high-priority targets and low-hanging fruit can yield a high ROI for your efforts. Once you know a company is interested in your offerings – say if they spent some time on your product page and clicked through to pricing – you need to identify the key decision-makers to reach out to. 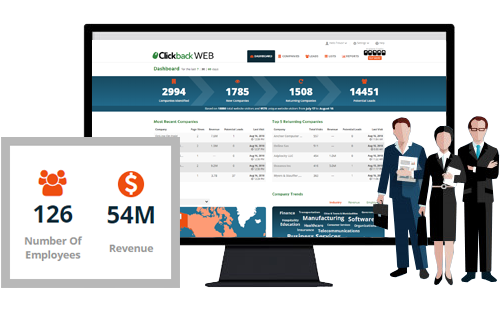 Clickback WEB provides crucial information such as job title to help with that, and provides you with contact information so that you can continuously feed your funnel new leads. You now have a collection of leads that previously would have gone unnoticed and can push these leads to an integrated marketing platform of your choice or export them as a CSV. This collection will only grow as people visit your site every day and Clickback WEB continues to keep your marketing funnel topped up with leads. In the process, you gain valuable insight into your visitors’ experience on your website. 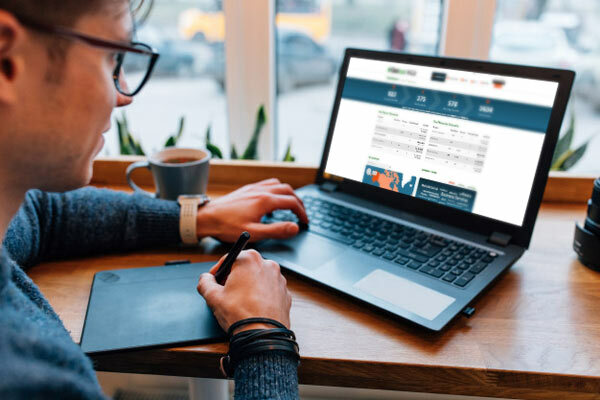 By recording your website visitors using Clickback WEB, you uncover metrics such as time spent on each page and which pages see the highest traffic. You can also see, for example, which industries are prevalent among visitors to your website, and which geographical locations. You might just discover new marketing opportunities. And all of these leads and insights were hidden among your website’s traffic the entire time.